Wednesday was sailing night. This week, rather than making something for me that Joel doesn't like, I decided to wait for him to come home so that we could eat together, even though it was late (9:30). 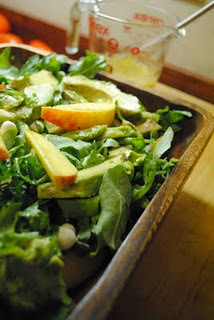 Because it was so late, I chose to make this salad which I found here at Baked Bree. This salad was quite delicious and we absolutely loved it. The dressing was so simple and thick. It reminded me of a honey mustard sauce. I would love to make it again as a dipping sauce to go along with chicken. In a small bowl, whisk together the mustard, honey, garlic, salt, and pepper. Steam in the olive oil while whisking and set aside. In a large bowl, toss together the arugula, basil, and parsley. Add the mozzarella and put in the fridge. Preheat your grill to medium heat. Cut the peaches and avocado in half and remove the pits. Brush the tops of each half with olive oil and season well with salt and pepper. Place the peaches and avocado flesh side down on the grill. Grill for a few minutes so that the flesh has grill lines but the fruit is still on the firm side. Slice the peaches and avocado and add to the salad bowl. Drizzle the dressing over the top and toss lightly. Season with additional salt and pepper, to taste.